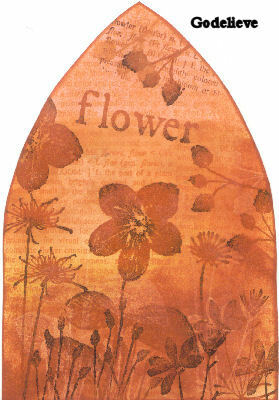 This weeks theme at Gothic Arches is “Flowers”…what do you think of? a bright spring day with tulips blooming? a summer field of sunflowers? autumns harvest of mum plants? whatever comes to your mind we would love to see it in the form of a gothic arch. I’m living in Belgium and I’m married to Chris for 28 years. We have two sons. Chris and I are giving our son Bert the special attention and care he needs. I’m addicted to stamping and blogging. It’s great to get in touch with stampers from all over the world. White is one of my favorite ‘colors’ but my projects turn out quite colorful most of the time. You can visit her blog Stamping Mathilda for more inspiration. 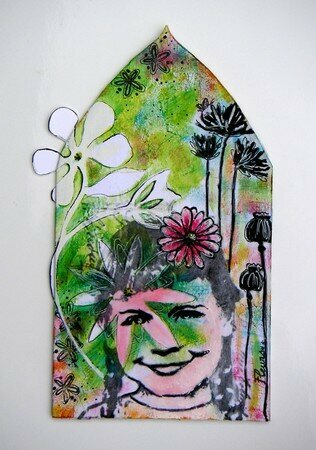 I really love this theme, and I look forward to seeing all the Flower Arches this week. Wow its a fanatstic Theme. Here is my entry for this week. Thanks for looking. Loved this challenge thank you. Here’s mine. Godelieve’s flowers are SO beautiful! Here is the cigar box I altered to hold all of my gothic arches. Now I’m off to conjure up ideas for the flower theme for this week! thanks for the fun theme Godelieve! My favourite theme!! Thanks Godelieve, love your arch!! I am heading out of town but wanted to play before going. I hope to see everyones creations when I return. I posted my entry to my blog last night but forgot to put my link here – I got caught up instead looking at other entries when I went to the comments section! This is such fun – here’s my first entry! I’m going to try and find a suitable spiral bound book to put these in – I know I’m going to be making loads more of these! Here’s my first proper entry to your challenge. I love all your challenges – thanks for the inspiration! Thanks for this lovely challenge! sorry I did something wrong. Hi this is my first entry for the Gothic Arch challenge. Just in the nick of time with this challenge! My “Flowers” Arch is uploaded now-thanks for looking! What a fun topic this week! I know I’m late, but I did not get the chance to do it earlier .